No walls needed - Magnatag's new RotoCube rotating whiteboards put information where people can see it. “What gets measured gets done,” says Magnatag® spokesman Christian Krapf. “The concept is simple but our customers tell us employees don’t pay attention to performance metrics unless they are easy to see and understand." With its compact space saving design, Magnatag’s new freestanding RotoCube® magnetic KPI whiteboard tower is helping production managers improve productivity. “We are up 10% since we started using these KPI boards,” says a Georgia Continuous Improvement Manager. 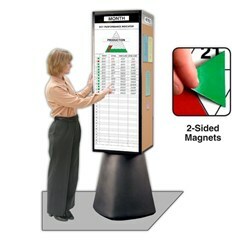 In addition to the KPI Pyramid, RotoCubes® are available with a choice of 29 standard magnetic dry-erase panel styles for communicating a variety of information. They come complete with everything needed to operate them including customizable board headings. For information go to http://www.magnatag.com/rc or call Magnatag at 800 624 4154. About Magnatag®: Founded in 1967, Magnatag Visible Systems® (A division of W.A. Krapf, Inc.), designs, manufactures and direct-markets over 2,300 plain and task-specific magnetic printed steel whiteboard kits, calendar planners, maps, custom boards, WhiteWalls, Bulletin Towers, document display, magnets, whiteboard accessories and other data display systems. Familiy owned since 1967, visit http://www.magnatag.com. No Walls Needed! New RotoCube rotating whiteboards put information where people can see it.